By Dr. Liz Thach, (2006). Published in French in Bacchus 2008 by Dunod, Paris. I often feel guilty that I haven't had time to write more about California's wine regions -- especially since I live in the Napa/Sonoma area. Some day, I keep telling myself....and then travel to another part of the world. So, as a place holder, I am including this article on California which I wrote in the summer of 2006. It was published in French, but never in English. So I thought I would share the English verion. The United States currently ranks fourth in the world for global wine production, with the State of California producing more than 90% of the wine. However, less than 15% of wine from California is exported to other nations, primarily due to the fact that the majority of California wine is consumed within the U.S. How did California become the largest wine producer in the U.S., and will they be able to achieve a larger market share in the global wine market? These questions are particularly compelling given the forecast that the U.S. is expected to become one of the largest wine consuming nations by 2010 (Long, 2005). In order to answer these important questions, it is the purpose of this paper to examine the evolution of California’s world wine position. The benefit of doing this will not only provide insight into current and future opportunities for the marketing and sales of California wine on a global basis, but will identify challenges and issues which the California wine industry must consider. Furthermore, it will describe some of the complexities of wine sales within the U.S. market as a whole, which may be useful for other wine producing countries hoping to obtain more shelf space within the lucrative U.S. wine market. This paper is divided into four sections. It begins with a brief overview of the history of wine in California and then, secondly, proceeds to an analysis of current statistics on California wine production, major regions and sales. The third section describes the current marketing and sales regulations within the U.S. which is not only challenging for the sales of California wine, but other exporting wine nations as well. Finally, the fourth section examines opportunities and issues for marketing California wine on a global basis, and explores such topics as differing consumer perceptions of California wine around the globe, as well as branding of California wine from a state or regional perspective for international sales. It is thought that the first wine grapes were brought to California by Spanish priests arriving from Mexico to establish the famous series of 21 California missions. The first mission was established in San Diego in 1769, and the last and northern most mission was built in the town of Sonoma in 1823. In the grounds of most every mission, the priests oversaw the planting of grapes which could be transformed into wine for religious ceremonies. The primary grape variety they used was called the mission grape, which is a red grape thought to be related to the Pais grape of Chile and originally from Spain. It creates a sweet, jammy tasting red wine, which was planted over much of California in the late 1700 and 1800’s. It wasn’t until the mid 1800’s that more traditional vitus vinifera grapes from Europe were introduced by Count Hazarathy, a Hungarian citizen who started the oldest continually operating winery in California -- Buena Vista Winery in the town of Sonoma. After a trip to France, Spain, Italy and Germany, he imported many varieties of European grapes and planted them in his Sonoma vineyards. Around the same time, other European immigrants – many from Italy and Germany – descended upon northern California to participate in the legendary California Gold Rush. They brought with them various grape cuttings, including the zinfandel grape from Croatia which was planted throughout the Sierra foothills. It is now one of the most popular grape varietals in California and has become a signature grape. In addition, many of these immigrants settled in Sonoma and Napa Valley after the gold rush, and began planting the varietals they had brought from Europe, including many Italian varietals as well as riesling and chenin blanc. Later, cabernet sauvignon, chardonnay, merlot, and pinot noir became more predominant. By the late 1800’s and early 1900’s, vineyards were abundant throughout California, spreading from the Temecula Valley in the south and then up through the regions of Santa Barbara, the Santa Cruz Mountains, Napa Valley and Sonoma. In the early 1900’s Sonoma County was the largest wine producer with more than 22,000 acres of vineyards (SCGGA, 2005). During this time California wine production hit an astounding rate of twenty million gallons, and wine was shipped throughout the U.S. and abroad, where it won numerous medals in the 1900 Paris Exposition (Lukacs, 2000). The primary reason that winegrapes grew so well in California, verses the other part of the U.S. where failed efforts to grow vitus vinifera grapes occurred as early as 1619 in Virginia, was due to the Mediterranean-like climate with its cool wet winters and hot, dry summers. All of this came to an end in 1918, when Prohibition was implemented in the U.S., and the production and sale of wine, as well as other alcoholic beverages became illegal. This lasted for 14 years, until 1933 when Prohibition was repealed. Only a handful of wineries were allowed to continue to operate under a special license to produce sacramental wine. These wineries included Beringer, Beaulieu, Krug, and a few others. The remainders of the wineries were forced to shut down, and hundreds of acres of vineyards were torn out and replaced with prune orchards and other crops. The unfortunate fallout of Prohibition was that the U.S. and California fell behind the rest of the wine producing nations in terms of expertise and consumer knowledge. What had been a growing and successful industry was nearly lost, and had to begin again. It wasn’t until the mid 1960’s with the advent of Robert Mondavi and his bold vision for California wine, that the industry slowly began to recover. In 1966, when Robert Mondavi left Krug and started the Mondavi winery, there were only about 30 wineries in the Napa Valley. Today, in 2006, there are over 250 wineries in Napa and 2740 wineries in California, with another 2624 spread throughout the other 49 U.S. states (WBM, 2006). The U.S. has worked its way up to becoming the fourth largest wine producing nation in the world, with California leading the way. Several drivers have been identified for helping to achieve this position, with the increasing quality of California wine being a major force. This was illustrated well in the 1976 Paris Wine Tasting when a Napa Valley chardonnay and cabernet sauvignon beat out high quality French wines in a blind tasting. This helped to put California wine in the global eye, and allowed for fresh capital to flow into the industry. Other drivers included an increasing American interest in food and wine; more frequent travel to European countries where Americans were introduced to wine; and a burgeoning economy – especially in the late 1990’s – that pushed some California wine prices to astronomical heights. All of these factors, and others, helped California wine achieve its current positive position within the U.S. wine market, and to some extent, on the global market. In reviewing some of the current statistics on California wine, there are four major areas that are useful to examine. The first is an overview of the major wine growing regions and appellations. Next is a look at wine grape acreage and production numbers. Third is a review of wine sales and key markets, including exports. The final section provides an overview of major California wine producers. 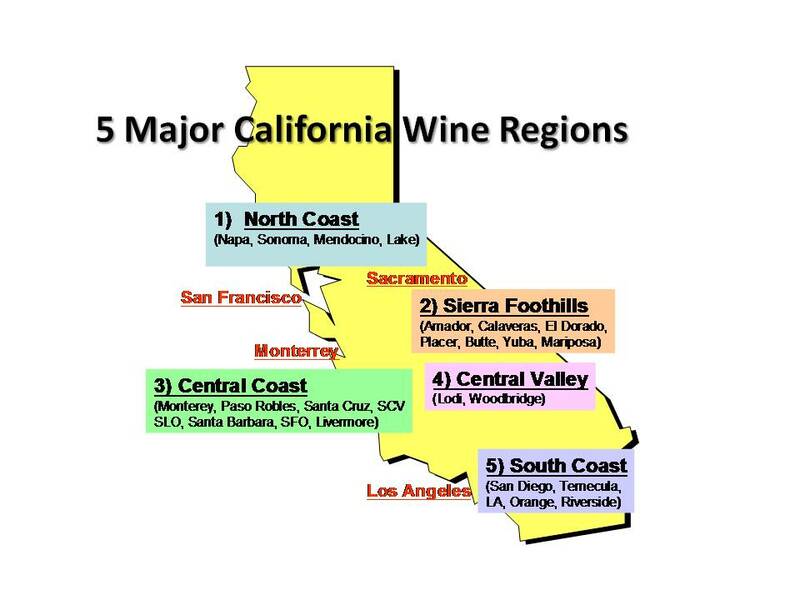 California is generally segmented into five major winegrowing regions as illustrated in the photo above. The five major regions are the North Coast, the Sierra Foothills, the Central Coast, the Central Valley, and the South Coast. 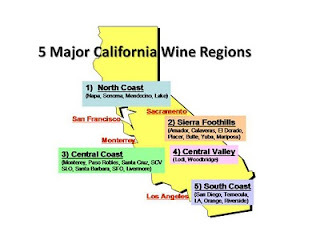 Each of these regions has specific AVA’s – American Viticulture Areas – that must be approved by the federal government. In general, an AVA is a designated wine grape growing region in the U.S. which is defined by soil, mountain ranges, bodies of water, and weather. Currently the total number of AVA’s in the U.S. is 150, with 94 being located in California (Zraly, 2006). The first region, the North Coast, includes Napa Valley, Sonoma County, Mendocino County, Lake County, and other north coast vineyards. This area is located north of San Francisco, and is known for its high-end cabernet sauvignons and chardonnays in Napa and Sonoma; old vine zinfandel in Mendocino and Sonoma County; sauvignon blanc grapes in Lake County, and wonderful pinot noir and sparkling wines from the cooler coastal regions of Sonoma County and Mendocino’s Anderson Valley. Napa and Sonoma counties are two of the most famous regions, and each includes 14 separate AVA’s. For example, some of Napa’s famous AVA’s are Stag’s Leap, Rutherford, and Howell Mountain. Sonoma County is known for the Dry Creek Valley AVA and the Russian River AVA. The second region is the Sierra Foothills where some of the oldest zinfandel vines are found. This region includes the counties of Amador, Calaveras, El Dorado, Mariposa, Nevada, Tuolumne, Placer, Butte, and Yuba. It has hot dry summers, but does receive snow in the winter months. It is known for its hearty red wines, including syrahs, zinfandels, and ports. The third region is the Central Coast, which is a large region stretching from Livermore and the San Francisco Bay area in the north, and then extending south towards the Santa Clara Valley, the Santa Cruz Mountains and Monterrey. It then reaches down through Paso Robles, San Luis Obispo, and ends at Santa Barbara. With so many different geographies, it is not surprising that the Central Coast is known for a wide variety of fine wines. These range from big syrahs and cabernet sauvignons in the hot region of Paso Robles, to delicate pinot noirs and chardonnays from the cooler climates of Monterey and Santa Barbara. The fourth region, the Central Valley, is the largest wine grape growing region in California and is known for its large-scale production of commercial table wines in multiple varietals. However, it also includes the Lodi/Woodbridge region, which is becoming quite famous for its rich and full-bodied syrahs and cabernet sauvignons. The fifth region, the South Coast, is the oldest grape growing region in California, but currently one of the smallest. It includes San Diego County, the Temecula region, Los Angeles, Orange, and Riverside. Of these, Temecula currently has the largest number of wineries and is known for its light fruity whites and sparkling wines. Vineyard acreage for wine in California was estimated to be around 800,000 acres in 2005, with a total wine production rate of 4,328,840 tons – up 20% from the previous year (USDA, 2006). As usual, a large portion of the grape production came from the Central Valley of California where much commercial table wine is produced. Top quality producing regions, such as Napa and Sonoma Valley only produce 4% and 5%, respectively, of all California wine. The most common grape varietal planted and harvested in California is chardonnay. This reflects the most popular type of wine currently sold in the U.S. at 25% of the market (ACNielsen, 2005). Table 1 below illustrates the grape varietals that were crushed in California for 2005, with chardonnay claiming 17% of the production; cabernet sauvignon coming in second at 12.5% of the production; and zinfandel in third place at 10.4%. In 2005, it is estimated that California produced 542 million gallons of wine; and shipped an estimated 535 million gallons of wine to markets within the U.S. and abroad (Wine Institute, 2006). Figure 2 illustrates California winery shipments to all markets for the last seven years, showing a positive upward trend. In 2005 the U.S. wine market had a yearly value at retail outlets of $25 billion and reached the equivalent size of 300 million cases (Cartierre, 2006). Of this, it is estimated that approximately 66%, or $16.5 billion, was California wine. In the U.S. market, roughly two out of every three bottles of wine sold is from California. Major markets for California wine in the U.S. are on the East and West coasts, and include large metropolitan areas such as Los Angeles, San Francisco, Seattle, Portland, New York, Boston, and Miami. However, a few central cities such as Chicago, Dallas/Fort Worth, Houston, and Denver also consume much California wine. California wine sales by price segment show that 65% of California wine purchased by Americans is less than $7. Figure 3 below illustrates the five common price segments used in the U.S. market. The fastest growing segment is the Super Premium segment with pricing between $7 - $14, which grew by 14% in volume in 2005 (Cartierre, 2006). The Ultra Premium wine segment, with pricing of over $14, recently achieved 10% of the volume, but has 35% of the revenue (Motto, 2006). According to the Wine Institute (2005), the economic impact of the California wine industry is $45.4 billion annually. This includes revenues from the wine industry and other businesses it impacts, such as tourism, as well as indirect economic benefits. It is estimated that 14.8 million tourists visit California wine regions and spend close to $1.3 billion each year. In addition, the California wine industry provides an estimated 207,550 full-time equivalent jobs in wineries and related companies, paying wages of $7.6 billion. Because of all of these reasons and more, wine is currently California’s most lucrative agricultural crop. In terms of export shipments, California wine shipments actually decreased in 2005 due, in part, to an increase in the U.S. dollar as well as some wineries shipping bulk wine to Europe for bottling. California wine shipments for 2005 were 95% of all U.S. wine exports and totaled 365 million liters valued at $625 million (USFAS, 2006). The volume was down 16% from 2004. The major export market for California wine is the U.K, with Canada, the Netherlands, Japan, and Germany being other top markets. Figure 4 below illustrates California’s major export markets and dollar amount for 2004. Of the 5364 wineries currently in the U.S., 2740 wineries are located in California. Since California is the largest wine producer in the U.S., it is not surprising that they also are home to five of the largest wineries by annual case sales. Table 2 below lists the top ten U.S. wineries, including their headquarters location. Altogether, in 2005, these ten large wineries sold 237.7 million cases of wine in the U.S. market. This accounts for almost half of the wine sold. Therefore, there are many mid-size and smaller wineries within California and other states, as well as imported wine, which make up the rest of the volume. Indeed, though the U.S. wine industry is dominated by a few large players, there are a multitude of small family wineries producing unique and artisan-type wines that are very popular with U.S. consumers. In addition, imported wines from other countries, such as Italy, Australia, France, Chile and Spain, are quite popular in the U.S. and currently maintain 26% of the U.S. wine market. Since the majority of California wine is sold in the U.S., it is useful to overview the marketing and sales regulations within the U.S. market. Rather than using just one system of regulations for alcohol sales, the U.S. market is instead regulated by each individual state, and in some cases, smaller counties within individual states. This makes selling wine within the U.S. just as complicated, in some instances, as exporting wine abroad. Due to the 3-tier system, currently more than 80% of the wine sold in the U.S. is via distributors (Thach & Olsen, 2006) who then sell it to off-premise and on-premise retailers. The largest volume is sold in off-premise establishments, such as large supermarket or retail stores like Costco, SafeWay, Albertson’s, Walmart, Target, and others. In order for California wineries to gain access these off-premise stores, they need to develop partnerships with major distributors who service these accounts. This can be challenging for smaller wineries because shelf and portfolio space is tight, and large volumes with consistent quality levels are required. In addition, assistance with attractive point-of-sales displays is often necessary to introduce the product. In general, only large wineries which can provide volume discounting or well-known established brands can enter this part of the off-premise retail channel. Other off-premise sales occur in fine wine shops, but less data is available to determine actual percentages. These types of stores can “hand-sell” higher priced wines to customers by personally educating them on the wine, the winemaking techniques, and brand story. They often host wine-tasting events to boost sales. This is an easier channel for small California wineries to access by building relationships with smaller distributors who do business with these types of establishments across the nation. Furthermore, in some states, such as California itself, licensed wineries can directly approach small wine shops and other off-premise retailers and request that they carry their wine. On-premise sales of wine in the U.S. are growing, due to the increasing popularity of wine bars and dining out in restaurants. In 2005 the dollar amount spent in restaurants exceeded the dollar amount spent on food in grocery stores (Motto, 2006). Some California wineries emphasize this channel more than the large off-premise channels, because restaurants and wine bars are willing to carry more expensive wines. Therefore, they look for and build relationships with distributors who have access to high-end restaurants or wine bars across the nation. Again, in certain states such as California, licensed wineries can approach on-premise establishments directly to sell their wines. A third method of selling wine that is increasing in popularity is direct to consumer sales which involves selling to consumers in winery tasting rooms, special events, and via the Internet. Though still a smaller portion of the market, this method has grown an average of 14% per year with one out of every ten bottles of wine sold in the U.S. being sold direct (Cartierre, 2006b). Many California wineries sell directly to consumers via their tasting rooms. A related method is to encourage consumers to sign up for a wine club, which enables the winery to ship them wine via mail – if they live in a state that allows for direct shipping. However, since only 32 states currently allow direct shipping of wine to consumers, this method is not always possible (Thach, 2004). Sales of wine via Internet are also hampered by these same conditions. At the same time, there is much pressure from consumers and other constituents to change the direct shipping laws within the U.S., so slowly other states are loosing their regulations and it may be possible to do more direct shipping of wine in the future. Despite the current restrictions on direct to consumer sales, many California wineries see this channel growing. The other obvious advantage of this method is that wineries do not have to factor in distributor and retailer mark-ups, and can, instead, keep those margins for themselves. This makes the direct to consumer channel the most profitable for California wineries, and a few smaller wineries do sell 80 to 100% direct. However, this method is not viable for larger wineries which depend on volume sales and national distribution for their revenue. Given the evolution of the California wine industry and its ups and downs, such as a late start in winemaking compared to other nations and the setback of Prohibition, California has still managed to make much progress. The question now is how they will utilize their strengths in a very competitive global marketplace to maintain and enhance their position. Fortunately there are many opportunities, but also some issues which they must face. Table 3 below outlines the key drivers that are creating these opportunities and issues.  Increase in foreign wine imports into the U.S.
 Increase in wine production in other states within U.S.
A major opportunity is to capture additional market share within the U.S. market, since it is predicted to be the largest wine consuming nation in the world by 2010 (Long, 2005). This increase in wine consumption rates within the U.S. is driven primarily by the 70-million plus consumers who comprise the Millennial generation – the oldest of which are in their 20’s now and are consuming much wine. They are the children of the Baby Boomers -- an even larger generation of 80 million people currently in their late 40’s and 50’s who also consume much wine. In addition, the Hispanic population within the U.S., which is the largest and fastest growing minority population, is becoming quite interested in wine. All of these changes are spurred on by an increased interest in food and wine; more relaxed and balanced lifestyles; health; and other values. In order to increase market share in the U.S., California wineries will need to conduct market research to understand these new wine consuming populations. This will assist them in developing wine brands and advertising campaigns that appeal to these consumer segments. Already the Millennial generation has shown a preference for more fruit-forward wines with lower tannins and oak, as well as fun colorful labels that are not traditional in style. The Australians have led the way in appealing to this group, but some of the larger U.S. wineries have recently introduced some new, successful brands that are targeting this segment. In addition, a few wineries have made positive inroads with the Hispanic population by launching promotions in the Spanish language and matching wine with Hispanic foods. Despite these efforts there is still much opportunity in this arena. In addition to reaching these new audiences, California wineries will need to maintain and enhance their market share with existing customers in the older Baby Boomer generation. This generation is more sophisticated and is willing to spend more on wine, but is now moving into their 60’s. As current consumers, their needs still must be considered, and traditional California wine brands will need to “refresh” themselves to continue to appeal to this group. This calls for a deep understanding of current customers and the ability to be innovative to match changing consumer needs. A major issue which the California wine industry needs to consider to increase market share in the U.S. is the very competitive global market place. Americans enjoy imported wine as well as trying wine from other states. California wine currently holds a very positive perception in the minds of most U.S. wine consumers, and this image needs to be maintained. This is where a California wine branding campaign may be of use. A similar campaign was developed by the California Cheese Association and has been quite successful in the U.S. in promoting the consumption of California cheese and milk. In order to address the issue of imported wines, some California wineries have partnered with or acquired foreign wineries in order to import foreign wines into the U.S. This is a positive solution, because Americans appear to enjoy the variety that imported wines provide. Furthermore, with the large increase of vineyard acreage around the world, with huge plantings in Spain, Chile, India, and China, it is expected that there will be an increased supply of wine on the global market in the future. Therefore, large global wineries are rapidly acquiring wineries from all parts of the globe in order to provide an international portfolio of wines for their customers. Another opportunity for the California wine industry is to expand their export efforts. In the past there has not been much economic incentive to do so, because they were able to sell their wine so easily within the U.S. market. In addition, strong currency rates within the U.S. and complicated shipping regulations to overseas markets were other deterrents. However, in order to be strategic, long-term players in the global market, it is important for California wineries to invest in global markets. This is happening in some instances with both small and larger wineries, but there is still much opportunity for California to make efforts in this area. A key issue with California wine exports is the higher cost of California wine. Due to expensive labor and land costs, it is not possible for California to pursue a low-cost strategy. Therefore, they must focus on quality and value. This is a more sustainable strategy for the long-term, but takes more effort and time to implement. This is hampered by the fact that in some countries California wine is still not perceived to be equal in quality with some European wines. The development of a California Brand campaign may also be useful to help combat these issues. A unified global message about the quality and value of California wine could be useful in explaining the benefits and attracting new consumers. Some initial efforts have been made in this area with the assistance of the Wine Institute in San Francisco in organizing California trade shows and tastings in various countries. However, not very many wineries participate in these events, and many larger wineries prefer to focus on promoting their own brands, rather than a state brand. This is the same dilemma which other countries have encountered in their exporting efforts. However a few countries, such as New Zealand, Australia, and Spain, have developed very laudable country branding campaigns. Due to advances in technology, new breakthroughs are occurring everyday in viticulture and enology. In viticulture, new methods of mechanization, trellising systems, clonal advances, global position systems, and computerized farming are enabling vineyard managers around the world to plant grapes in new areas and produce higher quality yields at lower prices. In the cellar, similar advance are taking place with techniques such as micro-oxygenation; spinning cone technology for de-alcoholization, and co-pigmentation. Add to this the increased consumer interest in organic and biodynamic farming; sustainable winegrowing methods that are kind to the environment and people; and creative packaging alternatives, and it is obvious that the time of innovation in wine is now. Because of these advances, there is an opportunity for different wine regions to differentiate themselves. California has always led the way in innovation and entertainment in other industries, so there is an opportunity to do so with wine. In some cases, U.S. and state regulations will not allow certain types of innovation and advertising – such as the ban against advertising the health benefits of wine – but there are other opportunities open to the California wine industry. They have already made some strides by adopting the California Code of Sustainable WineGrowing, which is a voluntary self-assessment to improve environmental and social practices within the industry. Some regions are pursuing certification in this area, which will include a stamp placed on the wine bottle. However, this is just a small step, and there is ample opportunity to do much more in the areas of viticulture, enology, and wine marketing. Currently there is positive innovation occurring in individual wineries, but not a collective focused effort, such as New Zealand with their unified campaign of “wine from a clean, green NZ.” In California, a state with much ingenuity, there is still opportunity to pull together and create a unique and innovative brand message for California wine. In conclusion, this chapter provided an overview of the evolution of the California wine industry, including history, statistics, marketing and sales regulations, and opportunities and issues for the future. California currently holds an enviable position in the world market of producing a large amount of good quality wine that is easily sold within the U.S.market, and to some extent, in overseas markets. Their current position of possessing the largest market share of the lucrative U.S. wine market is very positive, since the U.S. market is predicted to grow at a healthy pace. California has also made some innovative inroads in wine, and has been a leader in creating the New World style of wine, which is more fruit-forward, higher alcohol, and is filled with complexity and boldness. Their efforts, have in part, spurred the development of an “international style” of wine, which has received a mix of reviews from wine critics around the world. California has also made positive progress on the environmental front with their sustainable winegrowing practices efforts. All of this points to a positive future for California wine, but it is critical that they remain focused and alert to changes in the global market place. The global wine industry will only become more competitive in the future, with large new tracts of vineyards coming into production in future years. At the same time, wine consumption is declining in certain countries. Increases in consumption are predicted in Asia, but this has not occurred to a large extent yet. Therefore, the profitable U.S. market will continue to be key export target for other wine producing countries. This means California wineries must continue to produce high quality and value-priced wines to maintain and increase marketshare; embrace innovation to create new segments of wine consumers; and explore partnerships with overseas wineries to collaborate on entering new markets. Given their past history of perseverance and regeneration, it is highly likely that they will be successful in doing this. ACNielsen (2005). ACNielsen scan data illustrating U.S. wines sales from March 1999 to March 2005. Cartierre, R. (2006a). 2005 milestones achieved by U.S. vintners. Wine Market Report, Vol, 9, Issue 9, Jan. 27, 2006. Cartierre, R. (2006b). Consumer Direct Thrives. Wine Market Report, Vol, 9, Issue 22, March 30, 2006. Fredrikson (2006). The Gomberg-Fredrikson Report. Available at: www.wineryexchange.com. Long, J. (2005). United States taking over as top wine consumer. Newhouse News Service. April 21, 2005. Lukacs, P. (2000). American Vintage: The Rise of American Wine. Boston: Houghton-Mifflin. Motto, V. (2006). State of the Industry. Presentation at Unified Wine Symposium, Jan. 26, 2005, Sacramento, CA, USA. Press Democrat. (2006). 2005 Grape prices and yield. Press Democrat. Feb. 11, 2006 issue. Thach, L. & Matz, T. (editors). (2004). Wine: A Global Business. NY: Miranda Press. Thach, L. & Olsen, J. (2006, In press). Building Strategic Partnerships in Wine Marketing: Implications for Wine Distribution. Journal of Food Products Marketing. Vol. 12, No. 3. USFAS (2006). U.S. Export Sales Reports. U.S. Foreign Agricultural Service Web Site. Available at: http://www.fas.usda.gov/export-sales/esrd1.asp. Wagner, P.; Olsen, J. & Thach, L. (2006). Wine Marketing & Sales: Success Strategies for a Saturated Market. San Francisco: The Wine Appreciation Guild. (In press). Wine Institute (2005). California Wine Industry Statistics. Available at: www.wineinstitute.org. WMB (2006). “Number of U.S. Wineries Tops 5300.” Wine Business Monthly, Vol. 13, No. 2, p.46-47. WMB (2006). “The Top 30 U.S. Wine Companies.” Wine Business Monthly, Vol. 13, No. 2, p.16-20. Zraly, K (2006). American Wine Guide. NY: Sterling. (Feb. 13, 2010) On our last morning, we slept in until 8:30 and then had a long, lazy breakfast drinking coffee and eating omelets at our table in our suite overlooking the lake and a beautiful sunny day. It was hard to check out of such a lovely resort and leave such a relaxing and beautiful room. Upon our departure, we drove the few blocks into town and found they were having a farmer’s/artist’s market, so we immediately parked. Wandering around the booths set along the lake, we found many charming souvenirs, and I was able to buy small pottery, glass, copper, and silver pieces from different artists. My favorite was a flattened wine bottle made into a clock with an inset of the local mother of pearl shaped like NZ. It now hangs proudly on my kitchen wall at home, and gives found memories of our trip to Central Otago. Later we took a walk along the lake and found the beautiful Queenstown Gardens with colorful flowers and ancient trees. From there we decided to drive back along Highway 6 to Gibbston Valley and Chard Farms wineries and be tourists for the afternoon. They are only about a 15 minute drive from Queenstown with amazing scenery along deep river canyons. We stopped at Gibbston Valley first and sampled some of the lovely cheeses at their Cheesery. Of course, we brought some to take home on the plane. The winery is a wonderful tourist stop with a big tasting room filled with fun wine merchandise and flights of wine to taste, starting at around $10NZ. They also have a nice restaurant surrounded with flowers. The roses were in full bloom, and it not only looked beautiful, but smelled lovely. Though we didn’t taste the wines, we found it to be a nice place to visit. Just down the road is Chard Farms Winery, which is not that easy to access, as you must drive along the steep canyon wall on a tiny one-lane gravel road with the raging river far below in the canyon. I can honestly say it is the most amazing and spine-tingling access to any winery I have visited in the world. What a place to plant a vineyard and build a winery – yet it is one of the oldest in Central Otago, and started out as a fruit farm. The winery building itself is a very attractive pink stone structure with sweeping green lawns and a great statue of a bicyclist which is made of grape vines – quite clever. We tasted through all of their wines and found they were making some delightful riesling and pinot gris. (In fact, due to this trip, I have now found that I enjoy NZ pinot gris; generally I find pinot gris boring and flaccid; these are fresh, floral, and have exquisite acid). Chard Farms also provided a very nice review of their different levels of pinot noir. I was impressed with this visit and the service. The tasting was free, but they asked that you make a donation if you didn’t purchase any wine. Very tasteful! After Chard Farms, we couldn’t help but stop at the bungee jumping center across the road, and were mesmerized by watching people jump from a high bridge to the river below. You have the option of being dunked in the icy cold water or not! Next door was a restaurant encouraging you to stop, eat, and taste some local wine after your jump. Wow – only in Central Otago! Reluctantly we headed back towards the airport to catch our 3pm flight to Auckland. There we had a short layover before catching the 7pm non-stop flight back to San Francisco – which was non-eventful and landed a few minutes early. The end of a truly amazing trip to New Zealand…. (Feb. 12, 2010) Our appointment at Felton Road was for 2pm with Garrett, the vineyard manager, and one of the most passionate organic grape growers I have ever met (and I’ve met quite a few!). He had so much energy and enthusiasm, he was almost bouncing off the ground. Felton Road has a highly justified reputation of producing one of the highest quality pinot noirs in New Zealand. After this visit, I can verify this is true….and I believe it is almost all certainly due to the incredible care and “love” they relish on their vineyards. Felton Road is located just 5 minutes down the road from Mt. Difficulty – rather at the end of the road. Since most of their wine is allocated, the tasting room is only open a few hours per week or by appointment. It is quite small – located in a small house with a wrap around front-porch and lovely organic garden with lots of lavender and humming bumble bees. The entrance to the winery is rather hard to find, and we actually accidently entered through the delivery drive-way, but enjoyed winding our way amongst the vines. Garret was there to greet us promptly at 2pm and immediately asked if we were up for a walk through the vineyards. We happily said yes and started off as he explained that they had 33 hectares of certified biodynamic vines, and they produce 10 – 11,000 cases per year. A large portion – 75% -- is exported to over 30 countries. Garret explained that they have 3 main vineyards, and try to plant chardonnay on the silt soil and pinot on the clay soil. They use 2x1 meter spacing, cane pruning because it grows faster in the spring, and are 85% on mixed rootstock. They plant buck wheat, yarrow and mustard every 10th row, and do all hand-tilling beneath the vines to fight weeds. They also create their own compost, but purchase the biodynamic preps from the Biodynamic Association of NZ. Garret explained that what makes them so successful is that all of the employees “buy-in” to the biodynamic process. They are proud to work there, and everyone is willing to pitch in. Because of the environment and culture, they attract the best people – and truly have a winning team. After about an hour wandering through the vines and examining crop load, cover-crop, soil, the insectory, tractors, and other aspects, we headed to the cellar. I was impressed with the large square cement and stainless tanks they are using for fermentation. Garret said they usually do 25% whole cluster ferment for the pinot noir, and use a combination of hand and pneumatic pigeage. We didn’t get much detail on the winemaking because Garrett said all of the “real winemaking” had taken place in the vineyard. Therefore I don’t know if they do cold soak; ferment temp; how many days until completed; extended maceration, etc. The only thing we know for sure is they use natural yeast. After gentle pressing, the pinots are aged in 30% new French oak, where they also go through ML. Elevage lasts from 11 to 18 months – depending on the vineyard and wine tier. They only rack before bottling. The chardonnay is all barrel fermented with racking and sulfur after ML; and aging for 11 to 16 months in 10-15% new oak. The cellar is attached to the tasting room, so we made a full circle and arrived back at the small, yet charming tasting room. Garret referred us again to the maps that illustrate the different vineyards and soil types. We then started the tasting which included 10 wines. All were wonderful, fresh, vibrant, clean, and very well concentrated – which is what I usually find in organic and biodynamic wines. They seem to have a pure energy, clean fruit, and are never thin. It is hard to select a favorite, but those that really delighted my palate were: the 2009 Felton Road Dry Riesling, with a ripe peach nose, mouthwatering juicy acid; and long finish. Delightful – dances on the tongue; and the 2008 Felton Road Chardonnay Block 2 – a bright apple nose/palate with spice; complex layers of flavor; and a long finish. Moving into the pinots, they were all so good and unique, it is hard to choose, but some of my favorites included the 2008 Felton Road Calvert Vineyard Pinot Noir which was ripe and explosive on the nose with bursting raspberries, yet deeply concentrated and complex on the palate. Wow! We ended up buying this one. Equally wonderful were the 2008 Felton Road Pinot Noir Block 3 with more intense concentrated raspberry and some savory notes; and the 2008 Felton Road Pinot Noir Block 5 with great acid, herbs and spice adding to the complex and powerful dark berry fruit. We left Felton Road in a very good mood and excited about our evening ahead in Queenstown. We headed back to the St. Moritz where we hit the hot tubs, then showered and got ready to celebrate our 25 year wedding anniversary. We started with appetizers and pinot in our room, and then headed downstairs to our reserved table with a lakeside view in Lombardi’s. The staff knew it was our anniversary and they treated us to two glasses of NZ sparkling wine on the house. As mentioned in a previous posting, the service was excellent and the food was some of the best we had in NZ. We started with a seafood appetizer with sauvignon blanc, then I had the lamb and Mike had the local venison –both with 2008 Earth’s End Pinot Noir, which was fruity, easy-drinking, and enjoyable. We ended with a wonderful dark chocolate dish with a glass of port. The plates were so artistically presented that I took pictures of several of them (see photos). It was easy to glide back to our room upstairs after such a magical meal. (Feb. 12, 2010) I love the name “Mt. Difficulty” – what incredible brand uniqueness. It’s almost impossible to forget. The minute I heard the name, I was intrigued as to why someone would name a winery in Central Otago this way. The mystery is solved though, once you arrive, because thrusting up in a craggy mound across a verdant valley filled with vineyards and rivers is a mountain which is named Mt. Difficulty. It was so christened because it was impossible to herd sheep over its steep and unfriendly terrain. The other cool thing about this winery is the script they use to write the name Mt. Difficulty. It is an antique scrawl with huge curls on the “f’s” – making it even more distinctive. This unique cursive is carved into a large rock signaling the entrance to the winery. The winery, however, is less impressive upon first glimpse. It is composed of a large warehouse to the right of the gravel drive which curves up a rocky desert type landscape to a small building at the top of a hill. This is the tasting room and a small charming restaurant with a breathtaking view of the valley below and Mt. Difficulty in the distance. It has both indoor and outdoor seating, and a menu – that in hindsight – we wish we had succumbed. We were immediately greeted in a friendly fashion. We asked for Matt Dicey, the winemaker, with whom we had an 11an appointment. It appeared he was slightly delayed, so we were invited to taste some wines while we waited. The selection was quite large with 16 different wines in 3 tiers, starting with the attractively priced Roaring Meg label (named after a waterfall on Highway 6 that we had passed); the estate series, and then the single vineyard designate pinot noirs which were $90NZ and above. We had tasted through about 6 wines when Matt arrived and bustled us down to the winery buildings. Mt. Difficulty is housed in a modern warehouse type facility, and is growing so fast that they have new tanks and barrels stacked outside. Currently they have 53 hectares of vineyards and produce 30,000 – 40,000 cases annually, and export 40%. They also buy some grapes for the Roaring Meg label from Marlborough. Matt is a friendly, down to earth person with a good sense of humor. He gave us a whirlwind, but thorough explanation of the winery, beginning with the soil which is a combination of clay, schist, Carrick gravel and loam. In the vineyard, they are on both 6x9 and 4x6 feet spacing, primarily with spur pruning on cordon/VSP. He said they are using the same pinot clones as most other local wineries: a combination of new Dijon (777, 667, etc. ), Pommard, and a DRC suitcase clone they refer to as the Able Clone in NZ – since it was brought in from someone with that last name. 40% of the vines are own-rooted with a mix of rootstock on the rest. Phylloxera is an issue since 2001 when it hit a neighboring vineyard. Rainfall is about 300ml per year, and they employ sustainable agriculture, choosing to use Round-up to control weeds. The climate is relatively dry, so there is no downy mildew. They do use sulfur, fertilizer, irrigation (including soil moisture meters which are linked by radio to the winery), and netting for birds. In terms of winemaking, I asked Matt to focus on the pinot noirs for which are they so well known. He said he uses 80% destem/20% whole cluster, with the higher end pinots coming from older vineyards. He does a 5 to 10 day cold soak and uses natural yeast, but sometimes needs to heat the tanks to start fermentation in stainless. Temperature is usually 30-32C with pigeage 3 times a day in the beginning. The complete maceration usually lasts 22 to 30 days. Towards the end he uses nitrogen to protect the wine. It is then gently pressed and allowed to settle before moving to barrel where it goes through ML. Higher end pinots are 30% new French oak with 11 months aging, and he never racks – even after ML! Generally they do not need to fine or filter, but will do so if necessary. After the tour, we returned to the tasting room to finish going through the line-up. Of the pinots, my favorites were the Mt Difficult 2007 Long Gully Single Vineyard ($90NZ) which has a beautiful floral and raspberry nose/palate with excellent concentration and length. The 2008 Mt. Difficulty Estate Series Pinot ($45) was also wonderful with dark berries and spice – a true classic Central Otago pinot. Other favorites included the 2008 Mt. Difficulty Riesling with lemon, lime, grass –but no diesel. Very refreshing. I also fell in love with the 2008 Mt. Difficulty Pinot Gris with a nose of white peach blossom. Finally I also enjoyed the 2009 Mt. Difficulty Target Gully Riesling with had a deliciously high acid of 9.5 with 40 g/l sugar – but so beautifully balanced that you hardly noticed the sugar and focused instead on the juicy citrus notes. Since our appointment was at 11am, and we finished around 12:30, we decided to go into the nearby town of Cromwell for lunch. What a mistake – the town really didn’t have any charming restaurants, even though they had a lovely historic area by the river. What’s going on with wine tourism in Cromwell? There isn’t any. It seems strange for such a historic town (gold rush and all) in the middle of many wineries. Why isn’t the town pulling together to capitalize on the opportunity? Why aren’t they showing off their beautiful river front acerage? Anyway, we wished we had stayed for lunch at Mt Difficulty, but felt rather silly going back again, so we kept searching. Eventually we ended up at a rather strange, but charming place called The Big Picture back on Highway 6. We had a nice fresh salad at an outdoor table next to the vineyard with very friendly service.